this is what i wore before i took off for a smallish break away from work and the city. i went rural ... to a lovely country inn. it being winter, the place was warmed by a multitude of wood burning fireplaces. i don't think that i have ever been in an inn where every room, including each and every guest room, had a wood burning fireplace. if only i could escape to such a place every weekend. i am wearing the alpen top, the fab skirt and the tokyo hat by kaliyana. 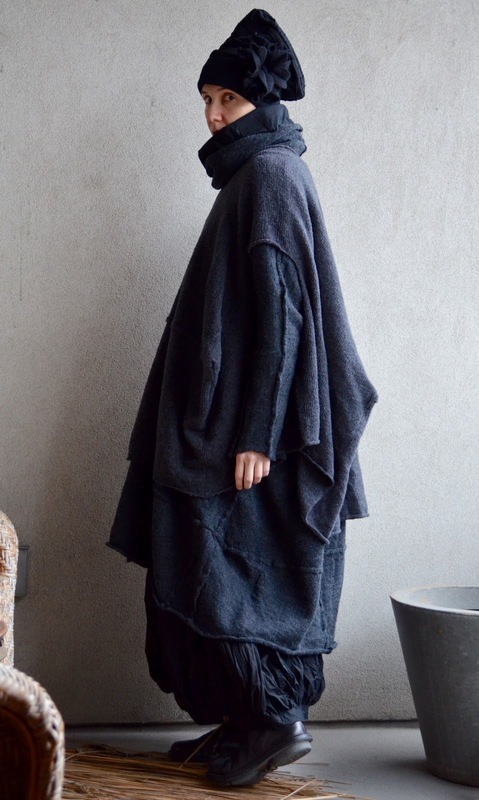 my woollen dress is rundholz (black label) and my vest is by grizas. my boots are the onion boot (closed collection) by trippen. yay for you having a get away. we all need to escape once in a while to recharge our batteries. the thought of a log fire makes me instantly feel comfy!! Perfection. Every layer, every texture,the shape of the hat,everything. Plus i love wood burning fireplaces. I have to add that I just scoured the Kaliyana website. Although the clothes are great, you make them look even better.